with 14 BONUS TRACKS + Thiazsch – Bonny Tails (2006) remastered !!! 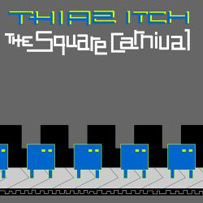 These bonus tracks could have been on “The Square Carnival 2”, but time passing … i thought it was a good idea to simply extend the first volume. The year of creation is tagged in each mp3. Entaché from lucie tHoc on Vimeo. Download the whole release HERE and read THIS. Nothing really fits, and well, you know, everything does, depending on how you look at it. This is how that compilation worked. Kind of throwing in different kind of shoes: sneakers, boots, high-heels (lots of those in there actually, mean to wear but kind of awesome to look at, you‘ll see. Listen. Where was I?) but in the end they are all shoes, right? Even with matching colors. Drone, breakcore, beats, melodies, we offer the whole menu in one go and you just need to (wo)man up to stomach that. But WaW turned 30 with that one, so we are grown-ups now, and you are too, are you not? Just kidding. Trying to think of a childish joke now, but nothing comes to mind. Too sad. No. Wait. Legends of the future. Shift and drift. There you go, stupid word-play. We promise, what we hold. In the mood of the Party Ruiners vol.1 & 2 compilations, Ego Twister Movie Ruiners is the new free music project from Ego Twister records. For this one, we asked 33 artists to reinvent an original movie soundtrack. To make the exercise a little more exciting, we asked them to avoid the use of any sample extracted from the original tracks, as we wanted them to produce real covers, instead of remixes.